Amazing 60-track anthology spanning 1966 to 2013! Includes band, solo and offshoot material, including 3 songs by previous outfits The Spectres and Traffic Jam as well as The Party Boys' "He's Gonna Step On You Again". South London members Alan Lancaster (bass) and Francis Rossi (guitar) were the original members and founders of Status Quo. Formerly known as The Spectres and later renamed to Traffic or Traffic Jam they settled for Status Quo as their band name in 1967. The following years they were joined by John Coghlan (drums), Roy Lynes (keyboard) and Rick Parfitt (guitar â€ 2016), and after several band members changes are still performing today in a revamped line-up. In 1968 their first hit record "Pictures of Matchstick Men" was released and the debut album soon followed. The subsequent years Status Quo, or simply Quo, enjoyed a multitude of hits; "Mean Girl", "Down Down", "Rockin' All Over The World", "The Wanderer", "In The Army Now", "Roll Over Lay Down (Live)", all climbed the charts in different countries. During the years Status Quo developed their own signature style of heavy rhythms, a few guitar chords, straightforward, accessible lyrics and collected a huge and loyal fan base. 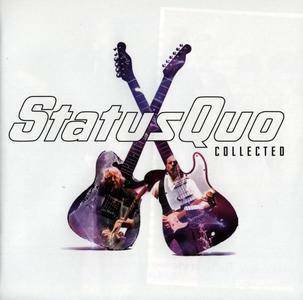 In 2006 NME magazine named Status Quo "The Most Successful UK band" as they achieved more chart hits than any other British band.